Hi, I am interested in your 2019 Forest River Flagstaff (stock #87344) listed on Autotrader for $35,995. I'd like to get more information about this vehicle and confirm its availability. 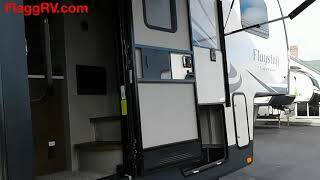 See how easy your next camping trip can be with this triple slide out Flagstaff Super Lite fifth wheel. In the evening you can plan to relax in the living area at the 76 hide-a-bed sofa or at the 44 dinette. You might even decide to choose the optional theater seating and/or the free standing dinette option if you like. From either the booth dinette or the sofa you can easily watch TV that is located along the rear wall which also includes anentertainment center and fireplace. You will love the L-shaped kitchen when making meals, the convenience of the double entry bathroom, and the master bedrooms storage. Outside you will find pass-through storage for your larger camping items, a gas grill, and even a ladder along the rear. Take a look!